This unique profile can also be created because this employee is not under the specific entity's payroll. Step 1: Head to Profiles > Employee Listing > Add Employee. Proceed to enter the employee profile details. Step 2: Under User Account, set the access rights to Admin and check Profiles, Payroll and Leave apps access. Then, hit the Save button. Step 3: Send an invite to this user so she/he can activate the new account. Hit the Save button. Step 4: Once the user has activated the account, you can delete the Employee Profile that you have just created. 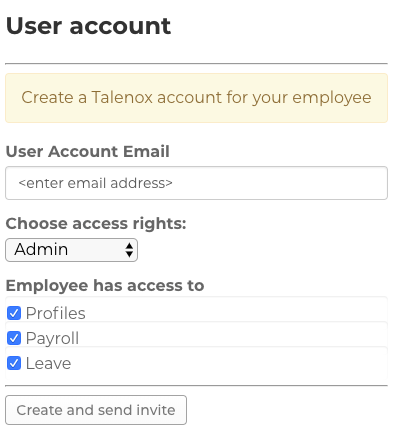 Step 5: You will find that the deleted Employee Profile is no longer displaying in your Employee Listing but she/he will still be able to access the newly-activated Talenox account.